Lego Giveaway! (Closed) | Daddy's in Charge? OK, we obviously know how much my kids love legos. Who am I kidding, I am the one with the obsession, I just make it seem like they are the ones in charge, at least with the Legos anyways. 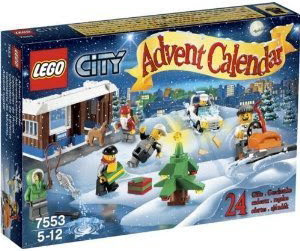 So I thought it would be a good idea to share with you, my readers, the chance to win something that I think is totally cool, a Lego City Advent Calendar. For those of you not familiar with this awesome set let me give you an idea what's involved here. The goal is to make the countdown to Christmas fly by a bit quicker for your little lego enthusiast. There are 24 separate little gifts each to be given out in the days prior to the arrival of Santa Claus. It really is the perfect way to kick off the holiday season, Lego style. I really can't imagine the excitement a child would get as he or she opened up these gifts everyday, and then on Christmas Day Santa brings them The Lego Death Star. I know my kids would be bouncing off the walls. If you already are a fan just write on my wall and say hey. So there you go, five different ways of entering. I guess technically you can have up to three contest entries per person. So have at it. While you are at it tweet me a picture or post a picture to my wall of what you look like as a lego. Who knows maybe some of you could appear in an upcoming Lego movie. The contest runs through Monday November, 14th at 11:59 PM and the winner will be announced (hopefully) that following Thursday, assuming I can count up the millions of entries that I am sure to get. Once that is done the winner will be contacted and God willing the prize will be shipped so you can have it by December 1st. One thing though, entries must be limited to the continental United States. I know boo. But what am I going to do, I can't guarantee something will make it to another country in time for the first and shipping overseas can get a little pricey. I am made of Legos not gold you know. Lego was in no way involved in this giveaway. This was strictly done out of the kindness of my heart, to share with you, my readers a little something to make your holidays a brighter one. Sometimes on our trips to TRU, my son doesn't have enough money saved to buy one of the bigger sets. On more than one occasion, I told him I was going to buy that set for myself. :) Sometimes the sets are so cool, we just need to have them. Peanut and I built a huge Lego tower just this weekend during that stupid snowstorm that canceled Halloween. Pic to follow to prove that even little girls love Legos. Found your giveaway from twitter! My son (and hubby) LOVE legos. They spent 8 hours building a huge star wars spaceship last winter. This Christmas...who knows! Thanks for the giveaway! I remember building a gigantic Lego castle as a kid. My mom was dusting and it crashed to the floor into a million pieces. I think it was the saddest day of my life... you know, at least until my dog died. PS - I love Legos! We are huge lego fans. My son is three nick named lego Logan and plays with legos everyday he even has his Dads legos from when Dad was three. His top bunk is devoted to lego building. We are also big Star Wars fans. We just went to our first trip to legoland last week. We LOVE Legos! We dont have ant star wars legos my son wld be super thrilled to have this. What a great idea. We love LEGOS so much that when we went on a trip to Toys R Us after they had just finished a family fun LEGO activity (that we missed), the cashier asked us if we wanted some free LEGOS! After inquiring what she meant(because LEGO and FREE don't play well in a sentence together), she showed us a huge box of 2X4 yellow bricks. My husband said he'd take them all and we are now proud owners of 2,732 yellow LEGO bricks. Booyah! We need Legos. We are the sad family that doesn't own any. Yet. I loved building with legos as a kid but never really had very many because I was one of 6 and we had to share. :) Now my kids love legos even my 2 yr old twins. I have a few mini figs of my own. My 18 yr old daughter took her vast collection with her to college if that tells you anything. Winning this would be so awesome. Thanks for the opportunity!! So... as a dad of 3 boys I have the obligation to say that I am forced to put the lego things together so they can play with it... BUT... we all know that in reality I am the one to blame for them getting legos at any opportunity! my whole family just loves legos! My husband and I remember them from our childhoods and we love making stuff with our kids now! I had no idea they had a holiday one! Boy it's amazing how many people LOVE Legos. Yes free and Legos NEVER comes up in the same sentence. This is the RAREST of opportunities LOL! I'm totally and utterly sad by this post and the fact that because i live in Sweden i cannot enter :( Now i need to go and sit in the corner and cry and play with my boys lego! I think we can still be friends though, maybe.. i dunno i'll come back to you on that one after i've drowned my sorrow with whisky & lego. Ben I am so sorry. Maybe one day I will visit you in Sweden and bring you your very own Lego Millenium Falcon! It might be cheaper to do it that way. I love legos and the pain they inflict upon unsuspecting bare feet. I love legos and the smiles they bring to my boys' faces. To see them explore with building is a wonderful thing. We love Lego over here. Too bad they are packed up and awaiting arrival of the moving truck right now. But when we get back east and open that box, it's like they are brand new all over again! and will blog it from the rooftops that I won! Oh we love leggos..I have never gotten this set though! My son made them for years..as he was looking over my shoulder..he was grinning ear to ear..he is 13! My 7 year old was thrilled too! So please add me to you hat!! I saw this set at Target today and had to think of this giveaway...ironic that you ended up linking up because I couldn't remember where I had seen the giveaway! : :) Legos rock!!! My boys have been wanting the Lego advent calendar for a few years now, but as we'd have to get two of them, the price is prohibitive! My boys have loved Lego for years - and use it all the time to build a kazillion different things LOL Thanks for the chance! Well, my boys really got into LEGOS about a year ago. My love comes when they're all cleaned up and I'm not stepping on them. We've got 4 kids who absolutely LOVE LEGOS, and who are we kidding, us parents love them as well!! We love Legos. Kids enjoy them at least once a week or more. Sometimes it seems they play with them everyday. My 11 year old wanted to learn more about the methods and building of legos and we started a 4H club to do that. We love Legos in our family. So much so that they were the main gift for the nieces and nephews in our family. They have the ones that pertain to Star Wars and ones that pertain to other subjects but let's say that there are Leo pieces all over the house and it reminds me of my childhood. Who doesn't love Legos! They unleash a kid's creativity while keeping them occupied. I especially remember the huge pirate ship my son got for Christmas one year and we all worked on it for days! Do I dare admit publicly that my favorite thing in Chicago was Legoland? Seriously. The rest was good, but it wasn't Legos. We are CRAZY about Legos. On a relaxed homeschool day, Lego learning is what we do. Even the big collection we have never seems to be enough! We always had Legos in the house - the advent calendar is new to me - how fun! My husband loves legos! And he's in charge, too! i love legos, they are a great way to keep kiddos busy and also keep their minds engaged! My 7 and 2 year old LOVE legos! My 7 year old Loves to build stuff with his imagination! It would be awsome to win! Legos were big in my family growing up. I would love to include this in my family's holiday this year! I adore Legos so much that I'm saving up for a trip to the original Legoland in Denmark. I have 3 boys and they love building and love building with Legos! My husband still hasn't grown out of it! Thanks! My daughter LOVES Legos, so I do, too. She loves to build castles. Thanks so much for the opportunity.! I personally love legos a ton, but I am hoping to win this for my son! I love LEGO, but not nearly as much as my husband, who still has all of his from childhood. LOVE legos. Such a simple toy that can keep kids entertained for hours. We love love love love legos in our house. And my nephew is a kind of lego genius. Love it! I follow you on twitter and tweeted. LOVE LEGOS! Legos are definitely one of the coolest and most versatile toy out there. I spent a date in highschool building a lego castle with a guy. It was AWESOME! I have 2 boys and they really do love their Lego! We love legos over here. I have 3 boys and we spent an hour tonight in the Lego isle at a big box store. My family & I love LEGOS! My daughter would absolutely love this!! Building with legos is y favorite activity to do with my 7 yr old son- he even forgets all about his computer/tv time, we get so immersed in Lego world. It's amazing how it inspires creativity! We love legos at my house. We are mainly a vintage lego household, as my husband has managed to hold on to the legos he played with when he was a kid. I am amazed that me managed to save all those pieces and the original boxes too! Wow, do I love LEGOs! My son perhaps loves them more, but I'm the one who keeps them sorted out for him, lol! I love Legos! Always fun to play with, no matter what age you are. I SUPER love Legos and I SUPER love advent calendars, so the combination is just pretty much fabulous! PLUS...I could totally make my husband smile if I gave this to him because he loves legos LOTS AND LOTS, hence the models that we have despite not having children. Just say'n. legos are awesome! i spend all my allowance money on them! Legos were my son's favorite as he was growing up. he still has a box in storage that he is saving for his children! I follow you and twitter AND tweeted you about how much I LOVE legos! Legos are quite possible the coolest toy ever! Thank you for an awesome giveaway! Legos: best toy ever. I strayed from the path of Legodom for awhile, but I'm back full force! My brother and I grew up playing lego, so fun for all ages and both genders, a perfect toy! I do love that the kids play with LEGOS.They just hurt my feet when I step on them. UGH!! I love Legos because they are educational for the kids first and foremost. They keep my reflexes in shape when I accidentally step on one with barefeet and jump in pain. They give me exercise from having to bend over constantly to pick them out of my dust pan when I sweep the floor and they give me hours of quiet time at our house because when the kids play with Legos they aren't fussing and fighting! Love the giveaway. we get the Lego or Playmobil Advent Calendars every years. And I say that in plural because we always have to have 2 so the boys don't fight. I've been a fan of Legos for about 20 years now, since my son was a wee lad. I have many fond memories of going to the store with him to get the latest Lego set and then admiring the sheer joy on his face as he put the pieces together. Even though he's grown, we still get the Lego Magazine. Now that I have a young grandson, I'm sure Legos will continue to be a favorite toy in our family line. my whole room is filled with 415 lego sets!!! Legos are awesome! One of my favorite toys as a kid. my son LOVE loves loves legos plays them daily, he gets i a zone when playing. Love Legos because they're one of the best "everyone in the family wants to play" toys! Became a fan on Facebook for this contest, too! Dude, I love legos! my sister and i always used to play legos!! we had a lego house and i kicked her lego person out cause i needed a spot for my lego flowers in the house!